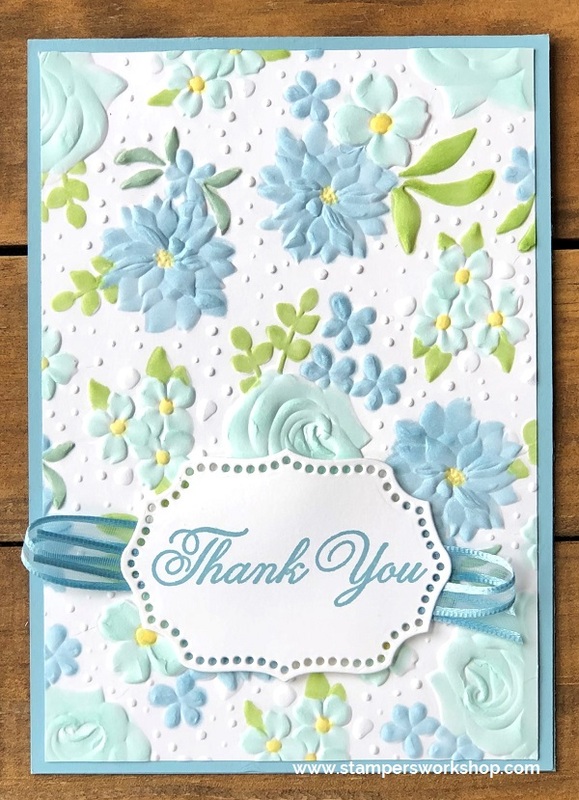 Hi everyone, today I am sharing a card which features the Country Floral Dynamic Textured Impressions Embossing Folder. The design of this embossing folder is gorgeous and I think you are all going to love it too. It’s one of those designs which looks great as the background of a card but which also looks stunning as the main element too. This is how I am using it today. I really wanted to make a feature of the gorgeous floral design. Initially, I was inspired by a card I had made back in April last year (which you can see here) but a lot of fellow Demonstrators in a Demonstrator Group started colouring the design with markers and they looked so good that I decided to give that a try too. Isn’t it pretty? I love the different shades of blue and green. It’s also super quick to make and you don’t have to be precise with your colouring as the different shades help give it even more dimension. Hi everyone, one of the colours I am crushing on at the moment, and you might have noticed it, is Highland Heather. It was introduced in the current Annual Catalogue and I just adore it. It really is the prettiest shade of purple. I have to stop myself, mostly unsuccessfully, from reaching for it again and again. Highland Heather is another colour featured in the Gingham Gala 6″x6″ DSP paper pack. 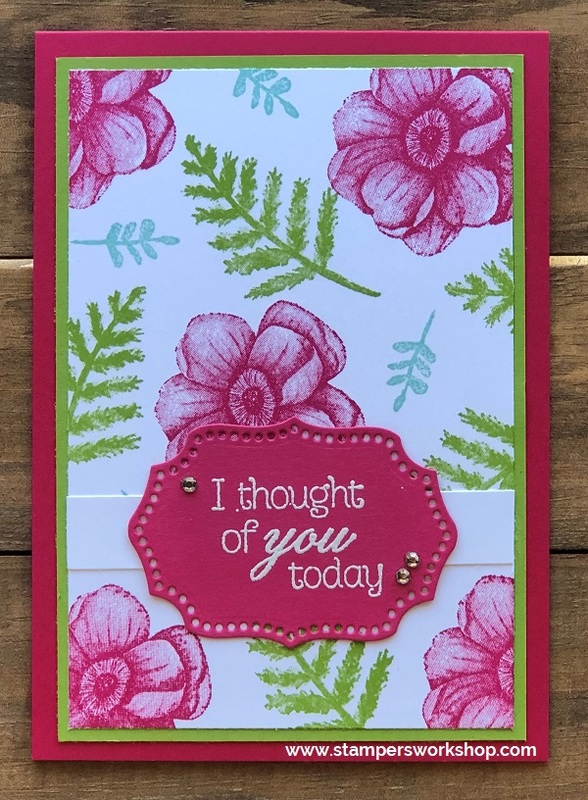 It was when I was going through selecting my papers for the cards earlier that I knew I would be making another version of the card I had CASED from the Occasions catalogue. You might remember I have already made two other versions. You can see my first card here and my second card here. Isn’t the Highland Heather version SO PRETTY!! I love it! 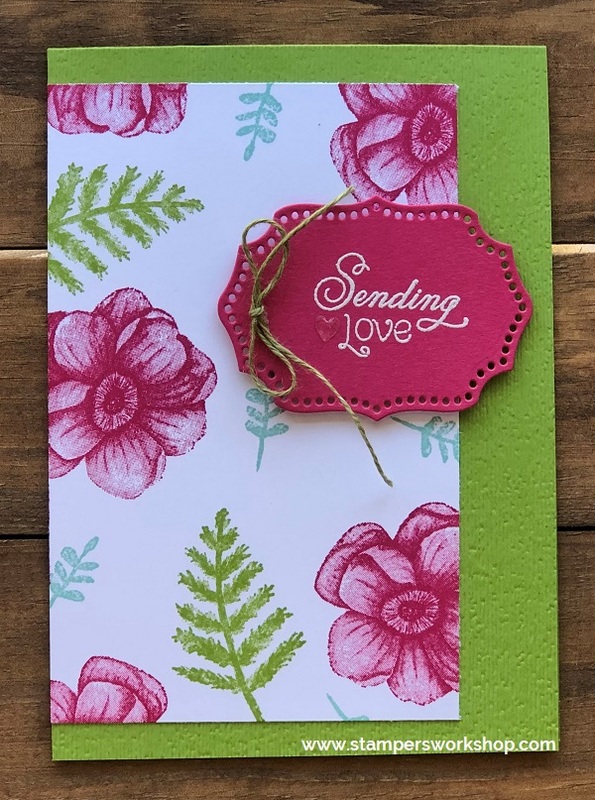 Don’t you just love the Climbing Roses stamp set and the coordinating Rose Trellis Thinlits dies (available individually and as a bundle) too? And this card is so pretty – I cannot promise I won’t make another one in a different colour palette. I just know any recipient would love it! Hi everyone, do you ever make a card and you love everything about it so you want to make it again and again? This is what happened to me when I CASED a card from the Occasions catalogue recently. You can see my first card here. I really wanted to make this card again but experiment with some different colour palettes. Since I had originally used the Grapefruit Grove paper from the Gingham Gala 6″x6″ DSP. I turned to this paper pack again to see what other colours might appeal. Of course…you guessed it! They ALL appealed so I started with the Balmy Blue. I am such a fan of this blue. It is so pretty. To add a little bit of sparkle to the card, I used the Iridescent Sequin Assortment. There is no Balmy Blue in this pack but with the iridescent nature of the sequins, the Pool Party matched beautifully. Don’t you just love the Climbing Roses stamp set and the coordinating Rose Trellis Thinlits dies (available individually and as a bundle)? I think they both offer so much – independently and together. And yes, I think you will be seeing another of these cards in the very near future. I’m addicted to this design! Hi everyone, today I am sharing another quick and easy card but one which looks like it might have taken forever to make. I promise you it didn’t take long at all. 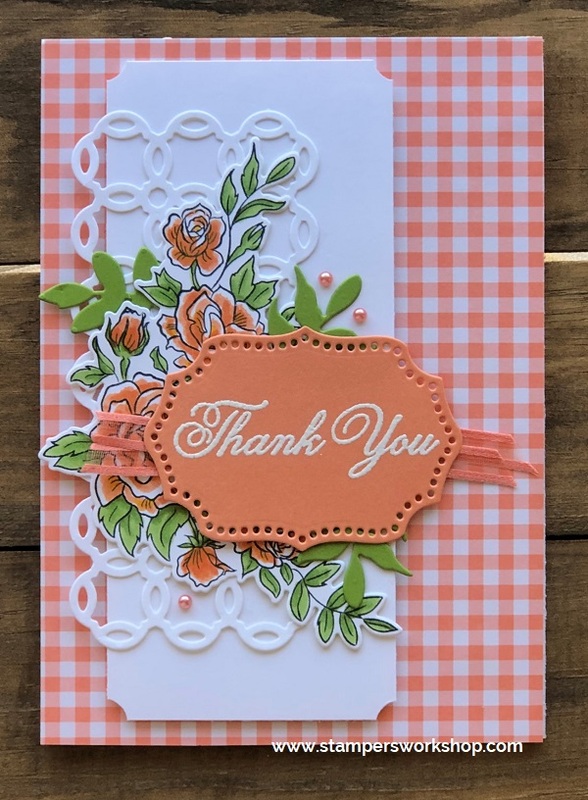 It was inspired by a card featured in the Occasions 2019 catalogue. I had originally planned to CASE the card but I ended up putting my own spin on it (and really isn’t that much better than simply CASE-ing a card). I used the lovely Climbing Roses stamp set which I coloured with Stampin’ Blends before cutting it out with the coordinating dies. I wanted a little more texture for my card base so I used the Subtle Dynamic Textured Impressions Embossing Folder – can you tell this is my favourite embossing folder? I added another panel to create some more interest. I stamped this panel with Balmy Blue ink. I stamped off a couple of times before stamping on the panel as I didn’t want it to be too bold. I decided to use the Well Written Framelits dies to create my sentiment. I die cut the thanks (just cut off the “s”)and the you dies multiple times in white cardstock and again in black cardstock. My big tip here is to use the Multipurpose Adhesive Sheets before you start die cutting. This way you can easily layer the die cuts and stick them together. I love this look! All that was left was to assemble the card. I think this stamp set may just be jumping to the top of my favourite list. It is so beautiful. I also LOVE the new Well Written dies. I am keeping my fingers crossed that it will make it into the Annual Catalogue as a permanent item. It’s a fabulous set! Hi everyone, there are so many card ideas in the Occasions catalogue which I just adore. I’d love to make them all and I sure plan to make as many of them as I can. 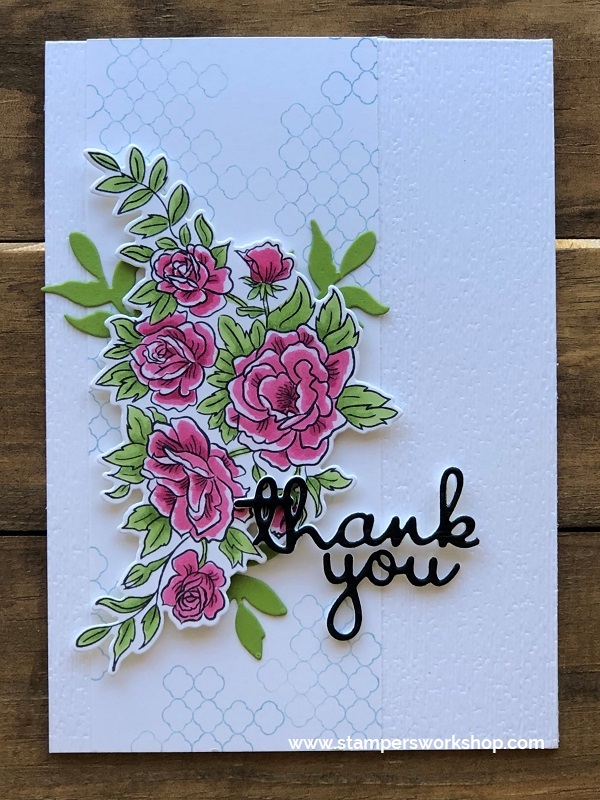 One of my favourite samples uses the Climbing Roses stamp set and the Rose Trellis Thinlits dies (available individually and as a bundle). I truly loved this card and just HAD to CASE it. The designer has such a great eye for design. Isn’t it pretty? I love everything about it! For this card is that I used my fine tip glue to adhere the trellis to the white panel. It was a little fiddly. If I was to make it again I would recommend using the Multi-Purpose Adhesive sheets as it would have been a much faster process. Do you have a favourite card in the catalogue that you just had to CASE?